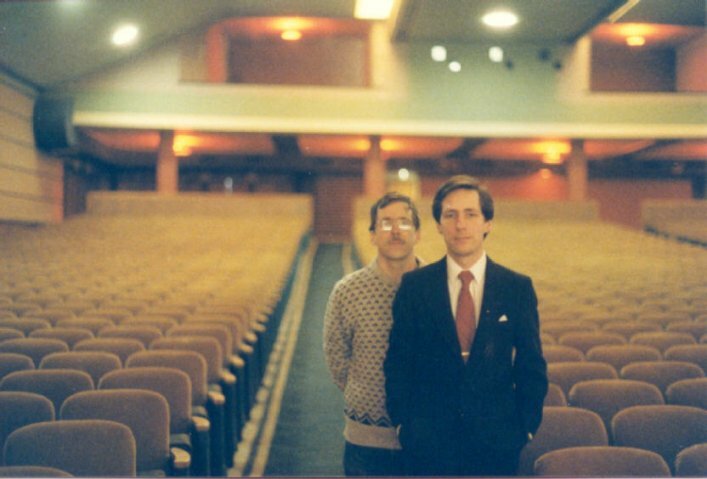 Following the 1937 fire that destroyed the original Strand Theatre, William Shriver decided he would rebuild his theatre as the finest boardwalk theatre in the county. 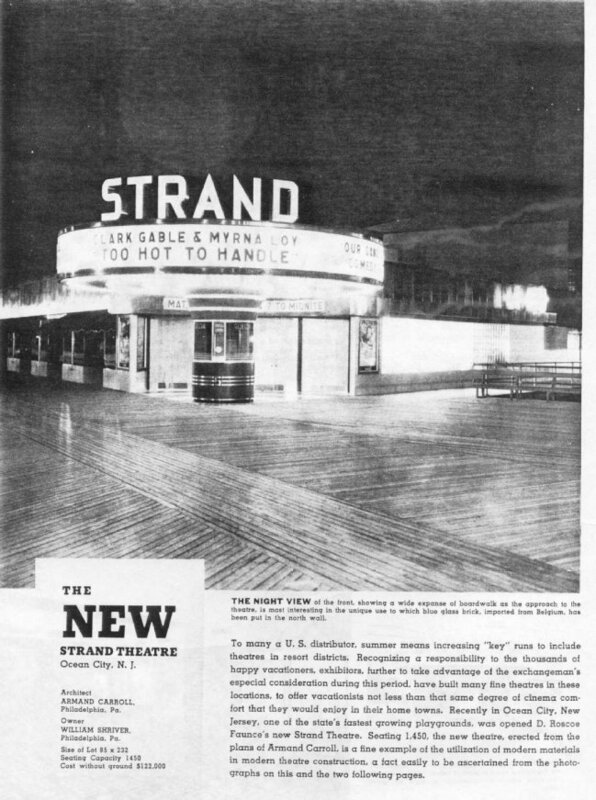 Using the architect Armand Carroll of Philadelphia, he designed a new theatre for the premium location at 9th and Boardwalk. 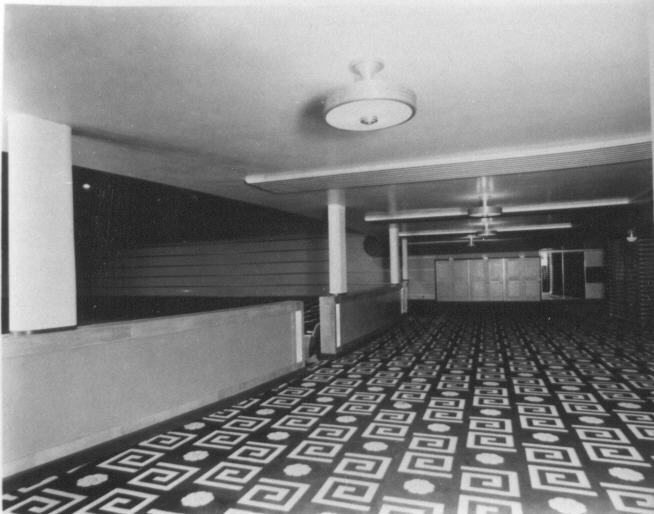 The corner had previously been home to a carousel. 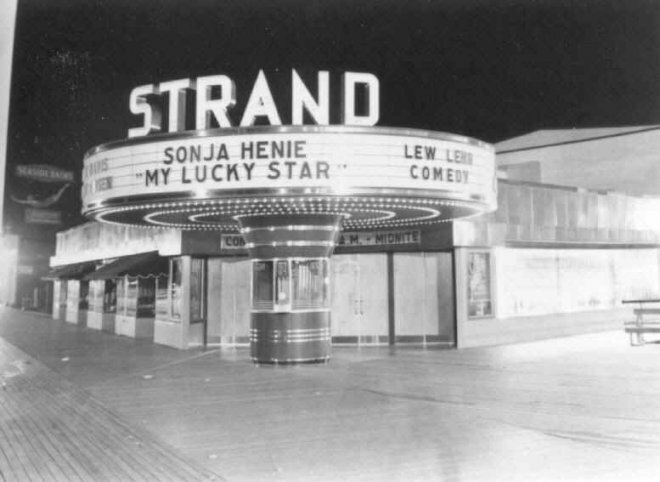 The old Strand burned down in the fall of 1937. 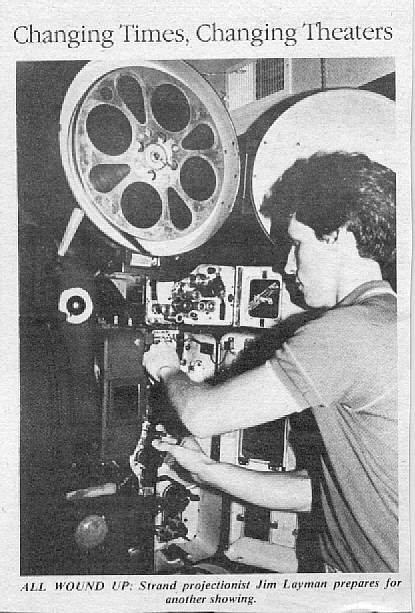 The new theatre opened for business on August 11, 1938 with Jack Senior as the manager and Fred Rest as the projectionist. 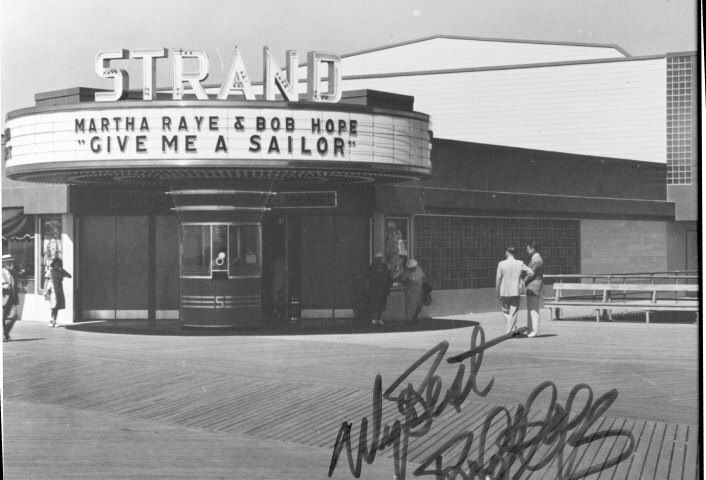 Adult tickets sold for 55� for the evening show, "Give Me a Sailor", staring Bob Hope and Martha Raye. (45� for the matinee). The day's total attendance was 1539. 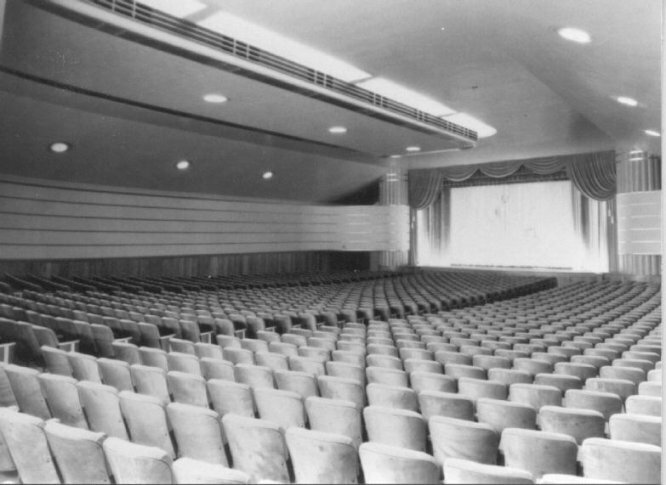 The new Strand theatre seated 1450, including twin balconies. 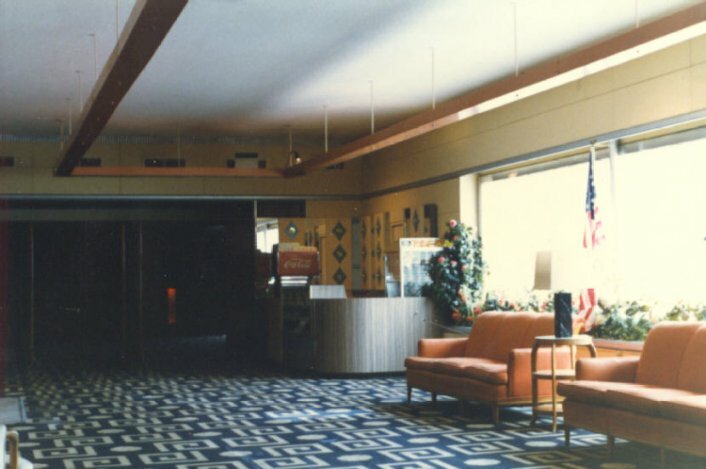 The outer lobby was a large area with one wall of blue glass block, imported from Belgium. 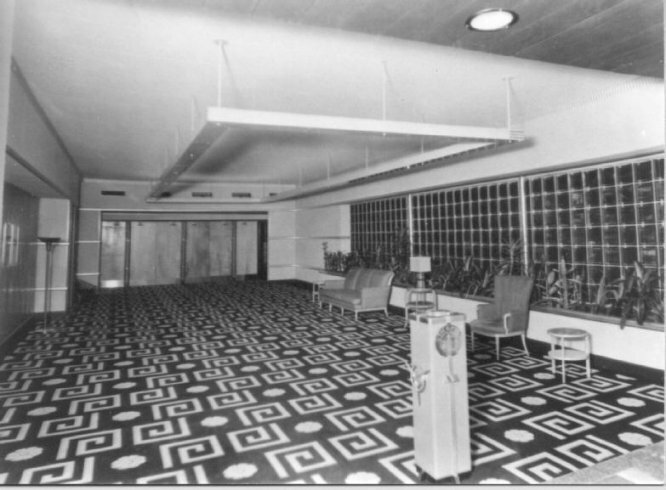 Couches, tables and upholstered chairs lined the lobby. 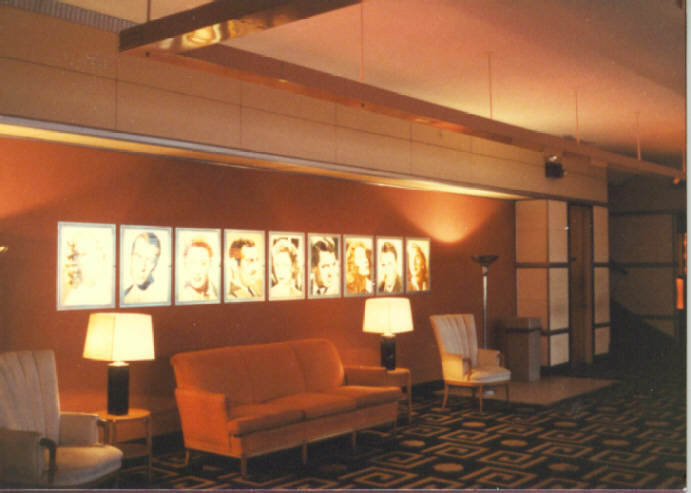 Back-lit portraits of Hollywood stars were set into the southern wall. 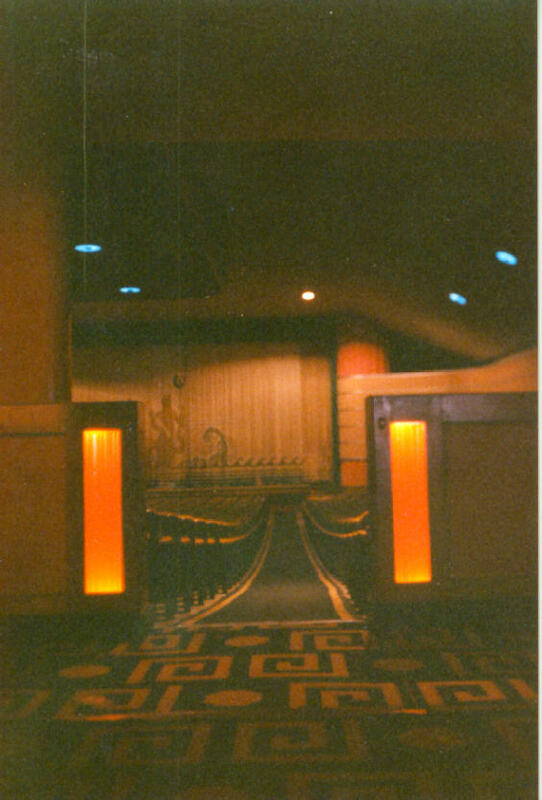 The outer lobby opened into the inner standee space, just behind the auditorium seats. 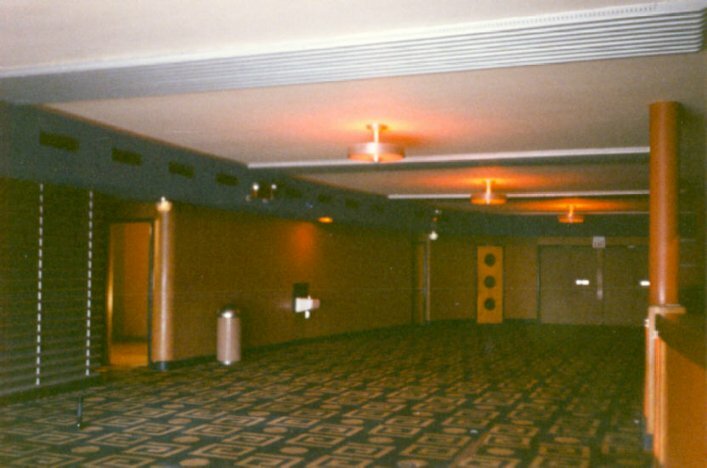 This large space offered lots of room for people walking to and from their seats. 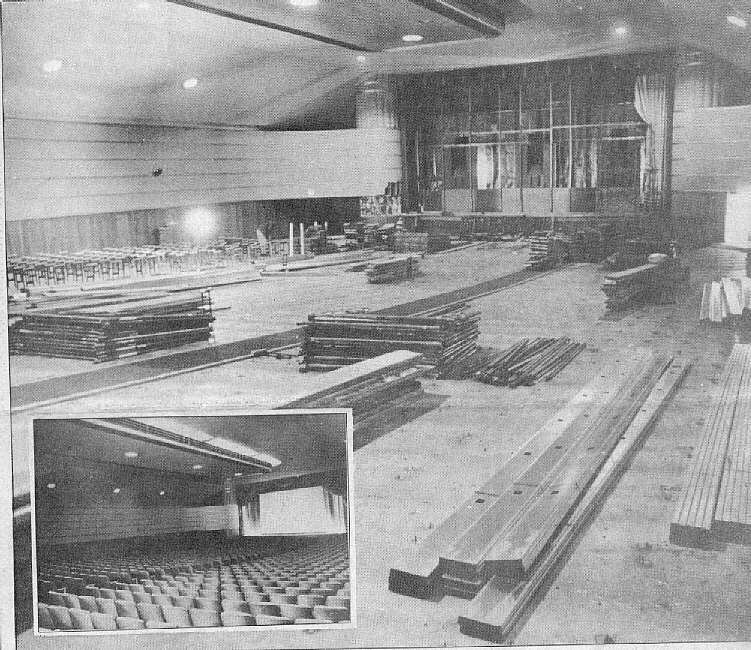 The auditorium walls had large horizontal bands that curved into the proscenium, wrapping around columns on either side of the stage. 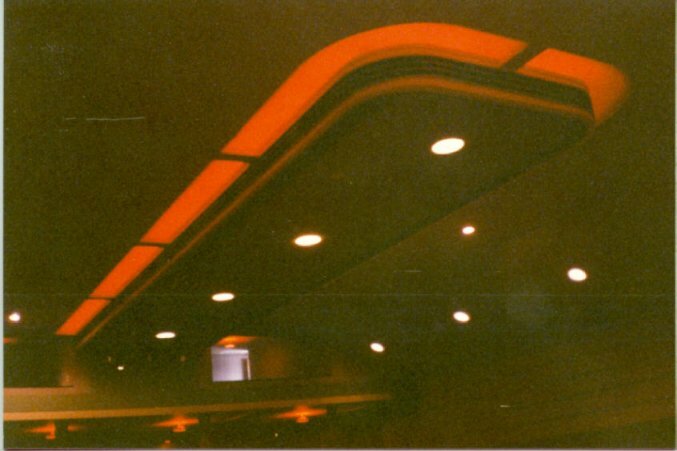 A curved island hung just below the ceiling and hid the colored auditorium lights and air conditioning grills. 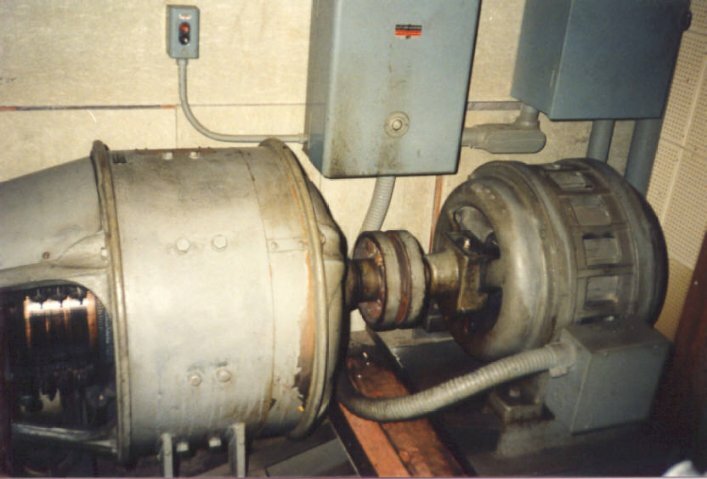 Like the other boardwalk theatres, the air conditioning system was a deep well that pumped cold water from the ground, circulated it through copper coils, and discharged it into the ocean. The ductwork could be configured to allow cool outside air into the system, or to keep the system closed. 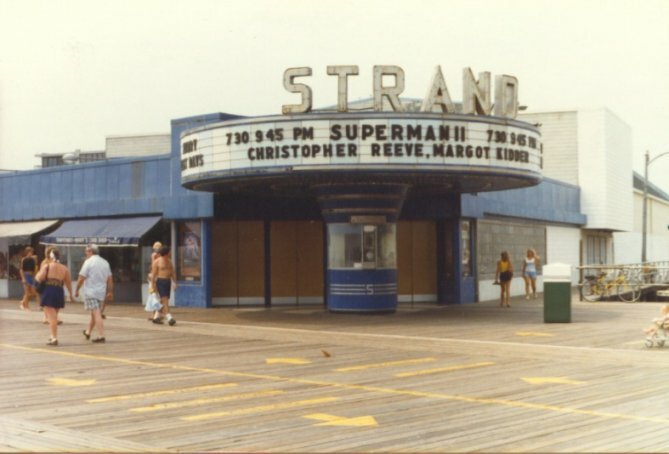 The marquee of the Strand consisted of a large circular disk over a round box-office. Rows and rows of incandescent lights lined the underside of the marquee and lit up the entire area. 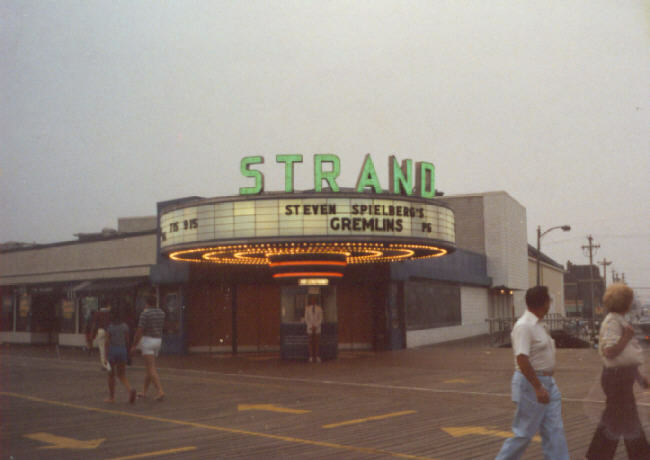 Neon lettering spelled out STRAND on the top. And a red neon ring encircled the top of the blue box-office. 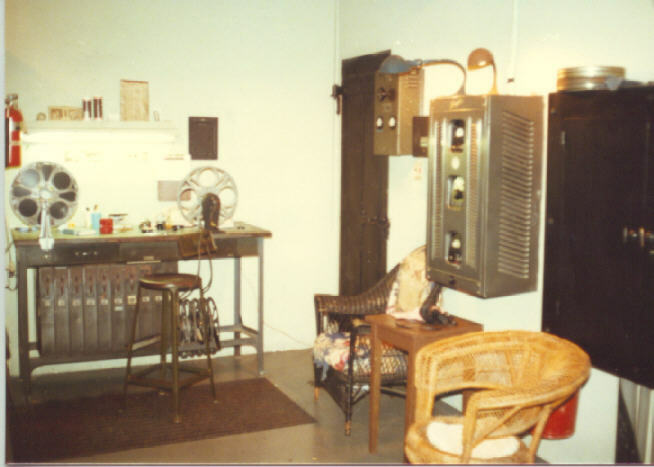 The projection room was a fireproof vault with a separate room for film storage. 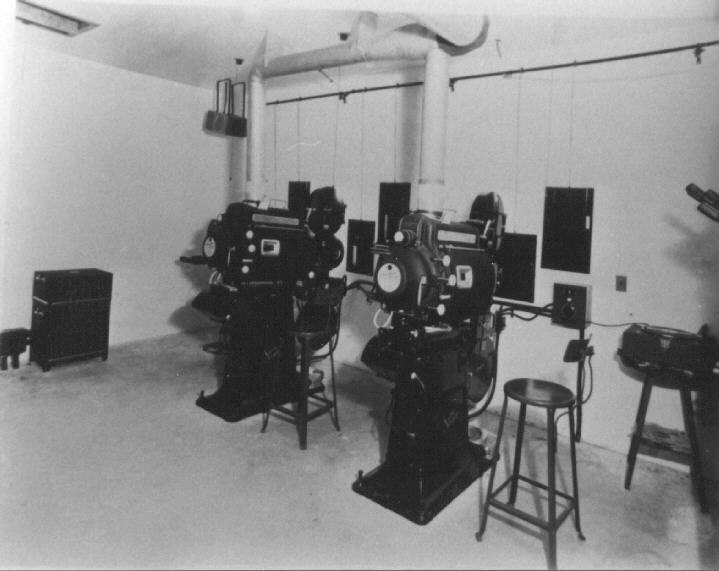 Peerless carbon arcs were used with Simplex E-7 projectors. 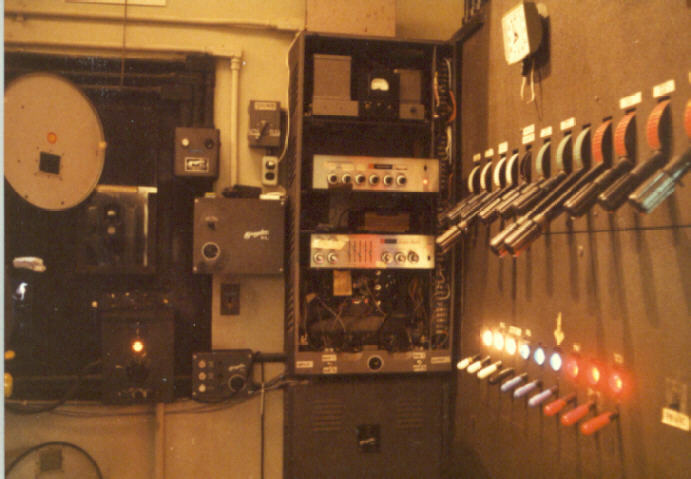 An autotransformer dimmer panel controlled the auditorium and stage lights from the projection room. 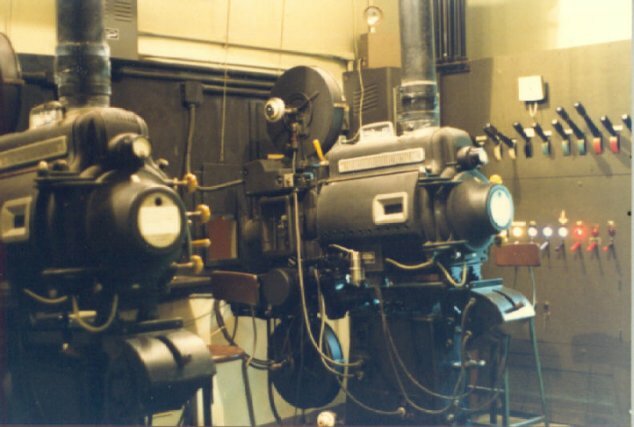 The projection room was upgraded, probably in the 1950's, with an over-sized Hertner generator (transverter) for stable DC amperage for the arcs, and with Simplex XL projector heads and a magnetic sound system. 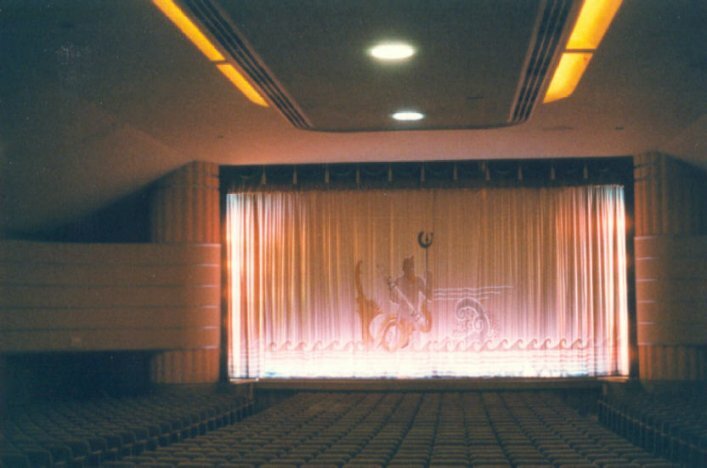 As with the other theatres, a CinemaScope screen was installed. 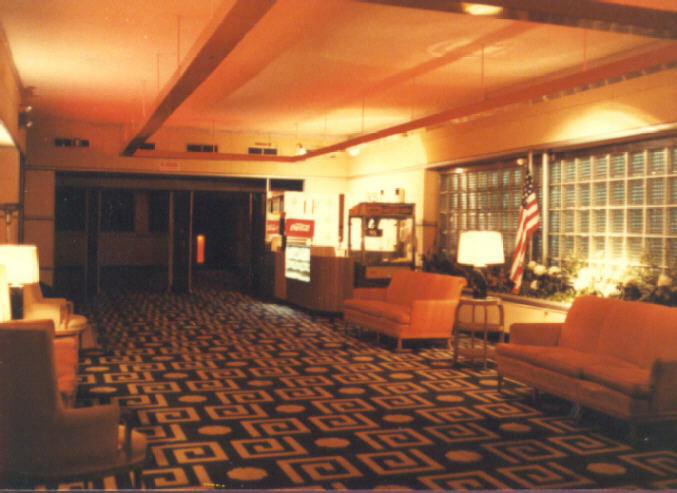 Except for the addition of a candy stand, the building remained unchanged for 50 years. 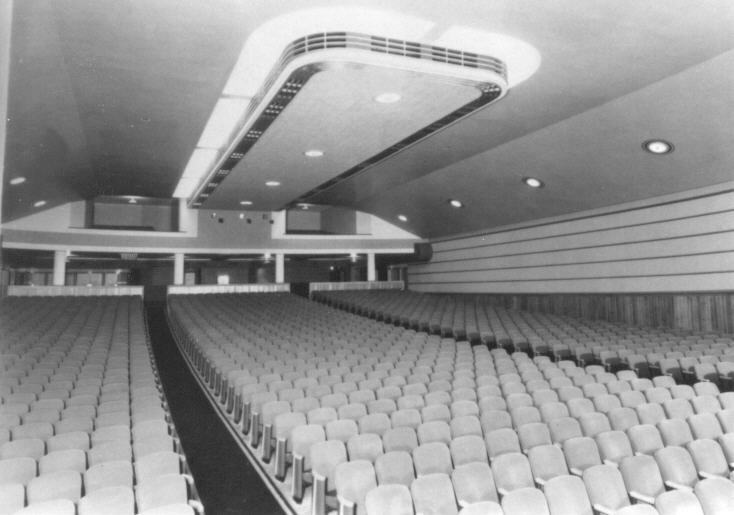 As the newest and most attractive theatre, it was kept in good repair during that time. 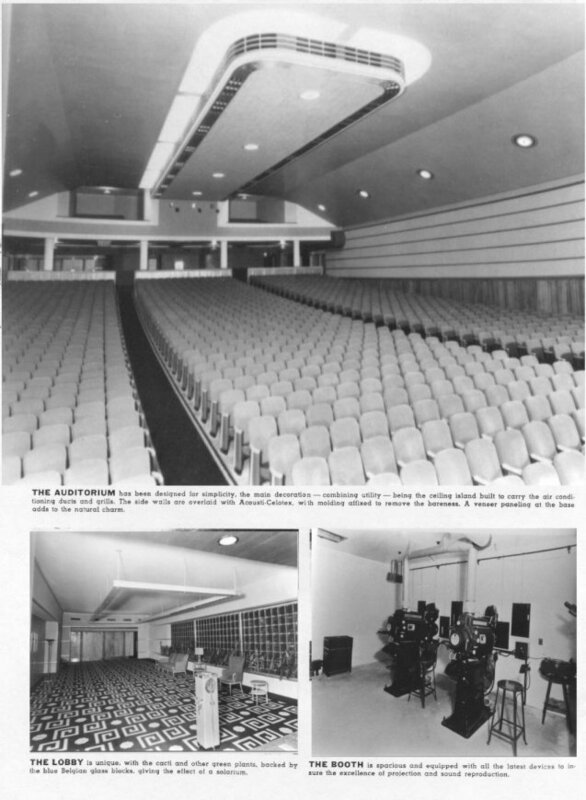 Each week, young employees would scrub the floors, polish the wood work and clean the seats. 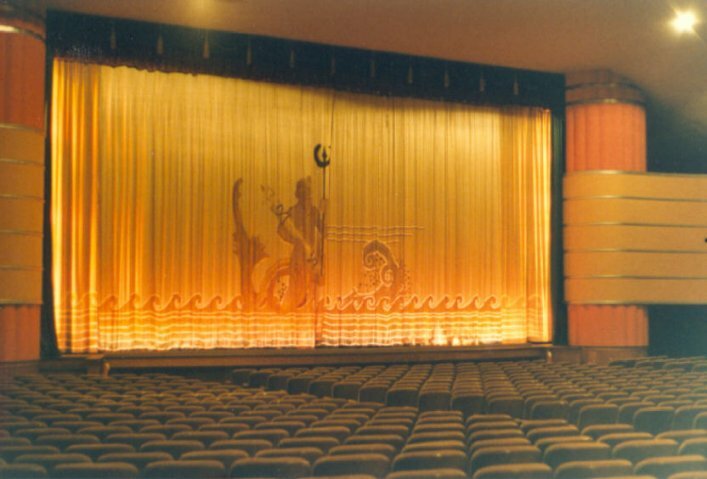 The theatre kept it's art deco, machine age, classic look until it was sold in 1989. 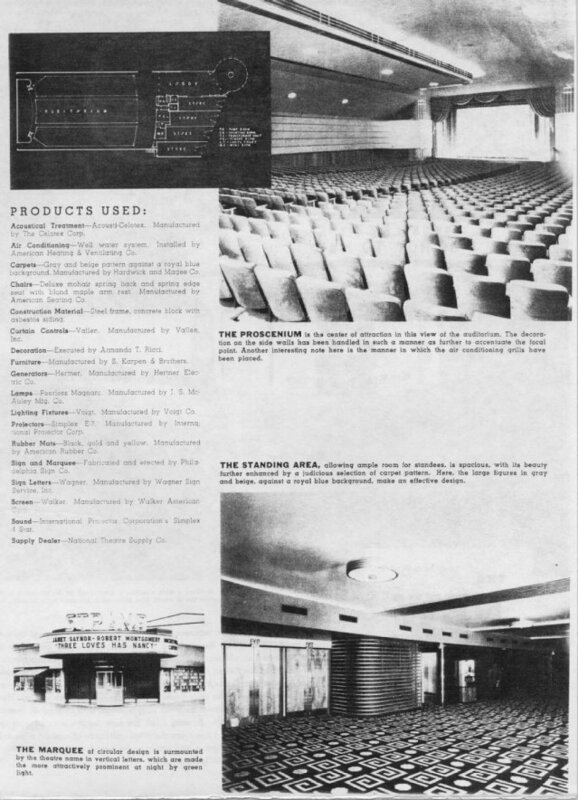 From the book, "New Theatres of 1938"
August 11, 1938. William Shriver and D.R. 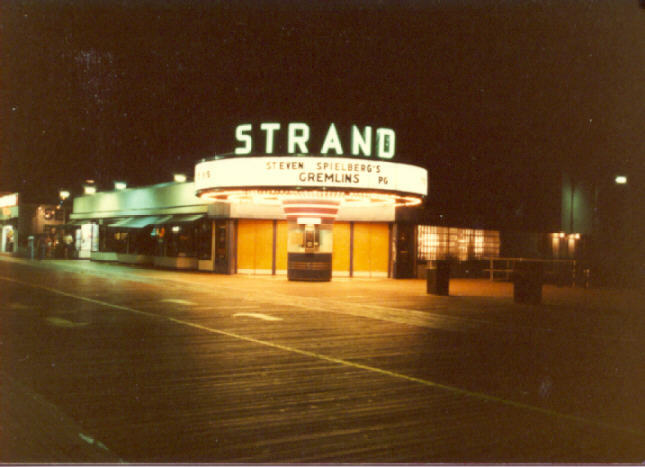 Faunce open the new Strand. From an photo signed by Bob Hope. The black and white photographs are from the first summer (1938). 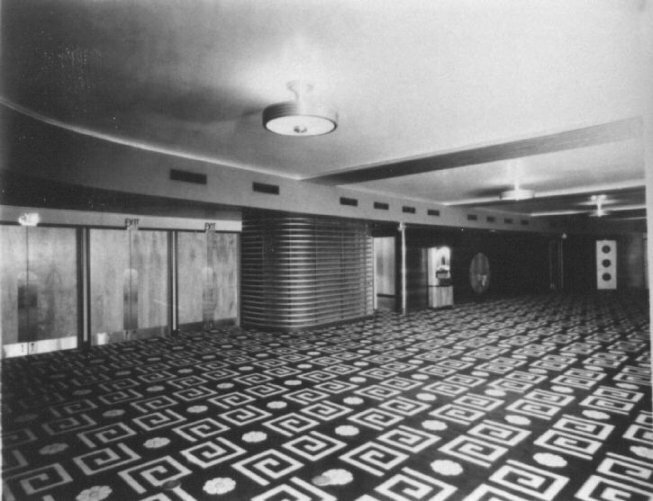 The main (outer) lobby. Age 1 and age 50. 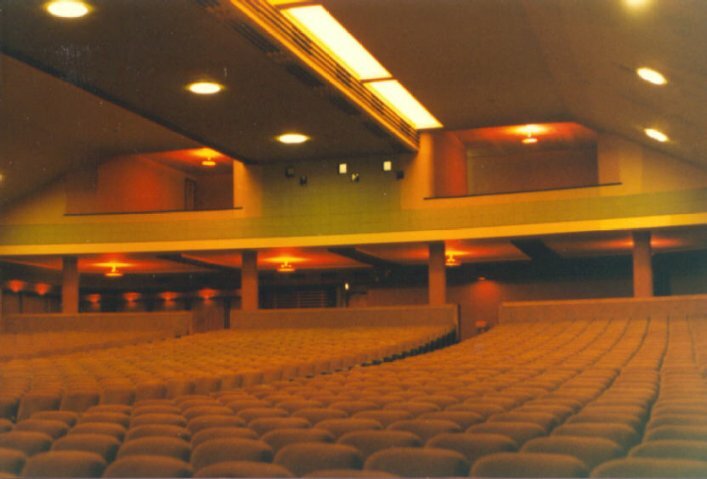 The auditorium, lighting cove. My brother, Chip, and I. 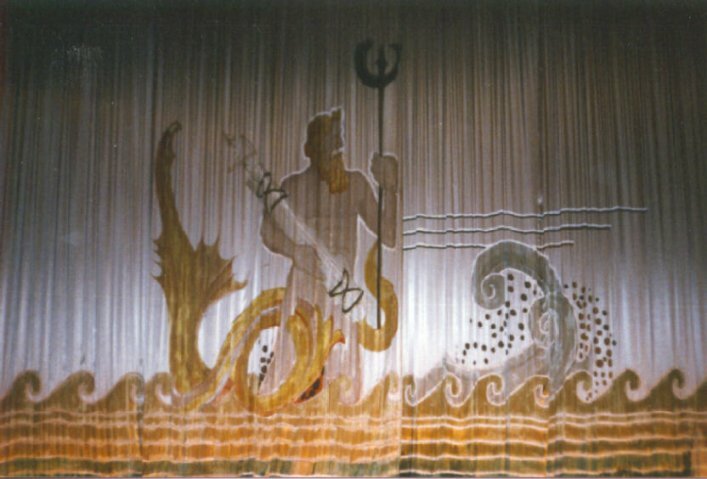 The screen curtain had a hand-painted image of Neptune. 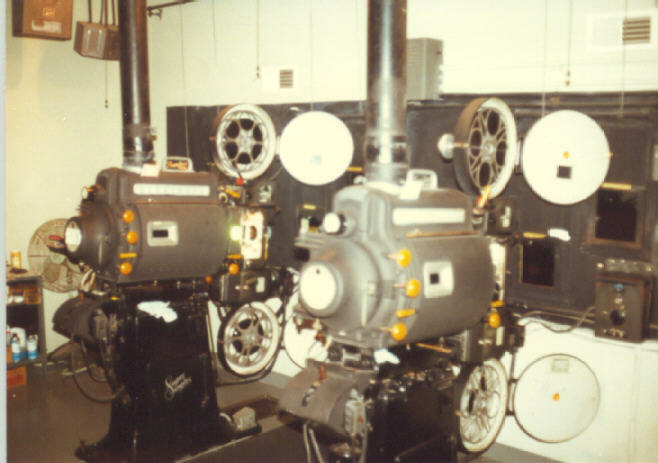 The projection room in 1938, and in 1988, still using 20 minute reels and arcs. The Strand was sold in 1989 and was quickly carved into 5 small theatres without retaining any of the original features or styles. Although the city's historical commission unanimously recommended keeping with the original design, the building was converted into a very plain, very drab, bundle of small screens and a pizza shop, under a leaky roof.